Like the rest of the world, we here at the GAMBIT Game Lab are shocked by the recent devastation in Haiti. One cannot help but wonder what it will take to rebuild the community leveled by this disaster. The people of Haiti need our help now, and we at GAMBIT have a plan! 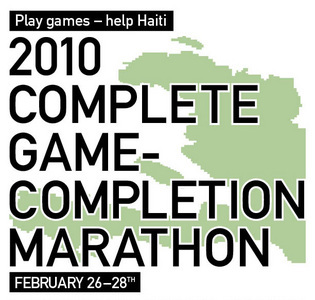 February 26-28th, GAMBIT will be hosting the 2010 Complete Game-Completion Marathon to raise money for relief efforts in Haiti. Teams of players will gather at our MIT lab to attempt to complete a game in one sitting. Participants will independently seek sponsorship on a dollar/hour basis with all proceeds going directly to relief efforts in Haiti through Partners in Health, and with support from the MIT Public Service Center. The labs will be open 24 hours a day through the weekend to accommodate the teams, with snacks and refreshments available for the players. How can you get involved? We need players or teams of players willing to marathon through some games for charity. Attached to this email is a registration form for the event. Each team will have one designated captain, who will receive correspondence from the lab regarding the event. Teams must make an estimation of the time required to "complete" a game. Completion of the game is defined by each team and can vary depending on participant availability. For example, one team may try to finish a game's story mode, while another may simply see how far they can get in 4 hours. The important part is raising sponsorship money, regardless of the duration of each team's specific "marathon." GAMBIT will build a schedule for the weekend based on your team's preferences for start times and availability. In cases where scheduling preferences cannot be accommodated, a GAMBIT staff member will contact team captains directly. GAMBIT has plenty of gaming consoles, PCs, and physical space. However, we cannot guarantee that we will have the game and an available system for you to marathon with, so we encourage players to bring in their own system and copy of the game for the event. If a team cannot play at the GAMBIT lab at MIT over the event weekend, that's okay! We encourage players to still raise sponsorship money and to play at home if they can. If you cannot marathon, then we encourage you to consider sponsoring a player. The registration deadline for the event is February 12th. Registrants will receive correspondence from GAMBIT confirming their registration and helping them to start collecting sponsor donations. For questions about the event, a list of players eligible for sponsorship, or ideas for how you can get involved, please contact Abe Stein for more information. You can also check back to this blog post for updated information about the event. Please consider joining us for this fun and important event! I take my hat of to you's guys at Gambit. I have a friend whose wife's family are all from Haiti, and she has lost most of them. So I know through her, how bad the situation is out there. We should all do are bit for humanity. Keep up the good work guys.